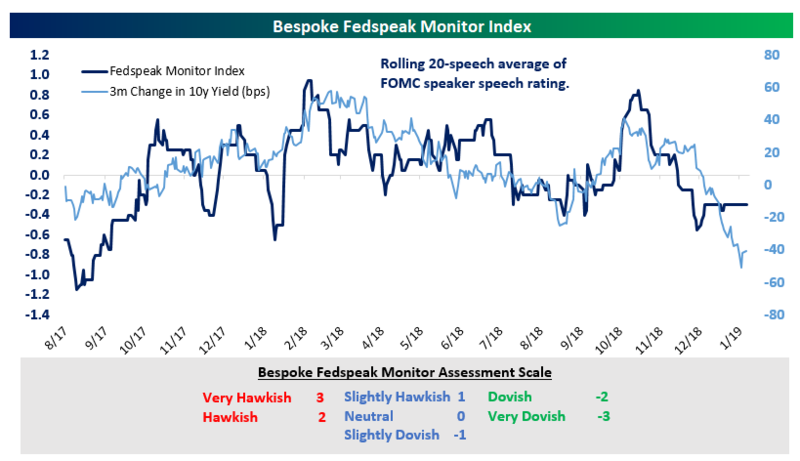 It’s no secret that the Fed has shifted more dovish of late, but in our running analysis of the tone in Fed commentary using our Fedspeak Monitor, the last 20 speakers have averaged a score just between “neutral” and “slightly dovish”. Our Fedspeak Monitor qualitatively tracks what FOMC members say publicly and classifies it to varying degrees of hawkishness or dovishness. Using each speech’s rating, we can keep track over time how hawkish or dovish the FOMC is. The result is shown in the chart below, which tends to track the 3-month change in the 10-year yield pretty well over time. Obviously, assigning a category of hawkishness or dovishness is a challenging exercise, but over time our gauge does a pretty good job tracking the movement of yields. As shown in the chart below, after the tone of Fed speakers moved into more dovish territory ahead of downdrafts in yields, their commentary has now been much less dovish than the market.